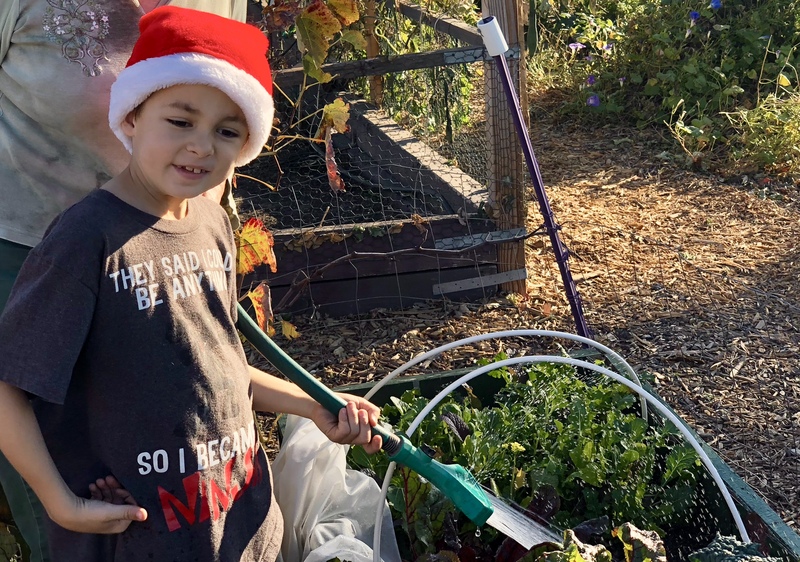 Kids can water their garden by hand, using a spray nozzle with an extended handle on the end of their hose, to get close to the soil and not wet the leaves. The goal is not to water the plants, but to water the roots and the microorganisms living in the soil. Kids need to water their gardens more when the weather is hot and windy, and not at all when it rains. When kids use mulch and row covers to help hold moisture in the soil, they can water less, as overwatering cuts off the air to the roots. Kids can set up a drip watering system with a battery run timer for an inexpensive, eco-friendly, and easy way to water the roots of the plants on schedule, especially when kids have a busy schedule. Drip irrigation systems are available at the hardware store with instruction guides and are perfect answer to container herbs and veggies on the patio, which can dry out easily. Every plant can get regular scheduled watering by attaching small tubes with emitters to each pot and hanging basket around the patio and attach a battery run timer for consistent watering. Drip watering is the most eco-friendly and economical way to water raised bed veggie gardens, reducing water usage and evaporation up to 70%. Because of the slow, precise delivery of water directly to the root zone of the plants, drip irrigation can keep the roots moist and healthy, reducing fungal disease, mildew, and rust. Kids can adjust the timer to give the plants more or less water depending on the weather. Kids can also connect the irrigation hose to a rain barrel to water the garden. When kids pay attention to the weather, they get attuned to natures rhythms. Kids can stick their finger in the soil and tell just how much water their garden needs on a daily basis.